Unneccessary adverts on Facebook really are like warm beer- Nobody wants them. If there is really some good or noteable new stuff, people will blog about it + upload some graphics from the adverts. And you ask why be freaky about a beer brand. They are almost all the same. Of course there is some minor difference but beer never really tastes “good”. It always is tasting a bit awful. People drink beer for various reasons but mostly for the reason to get drunk. Some brands are really bad and taste cheap + bitter, while others are more refined, and taste more sweet. As I say, minor variations. 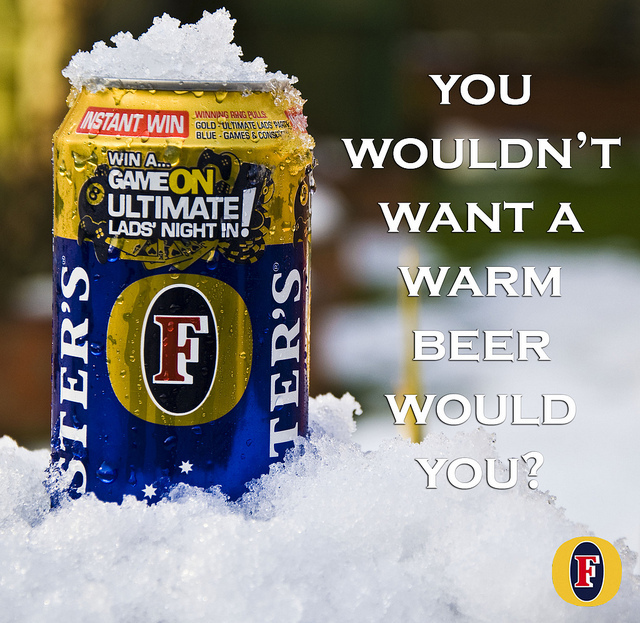 But why not try some Fosters. I really like the stuff.